The key to the Cyrus Cylinder’s (photo below) significance lies not so much in the beauty of the object itself, but in the story it tells. And what a story it is, I told my children after visiting the exhibition. The Cyrus Cylinder’s inscriptions tell the story of Persian king Cyrus’ historic march into Babylon in 539 B.C. With this conquest, he became the ruler of the Persian Empire, the most expansive empire ever known at the time. The inscriptions also describe how Cyrus used his newfound power to end oppression brought about by the previous ruler. Cyrus allowed exiled people to return to their homes in and around Babylon, and restored religious traditions and sanctuaries. 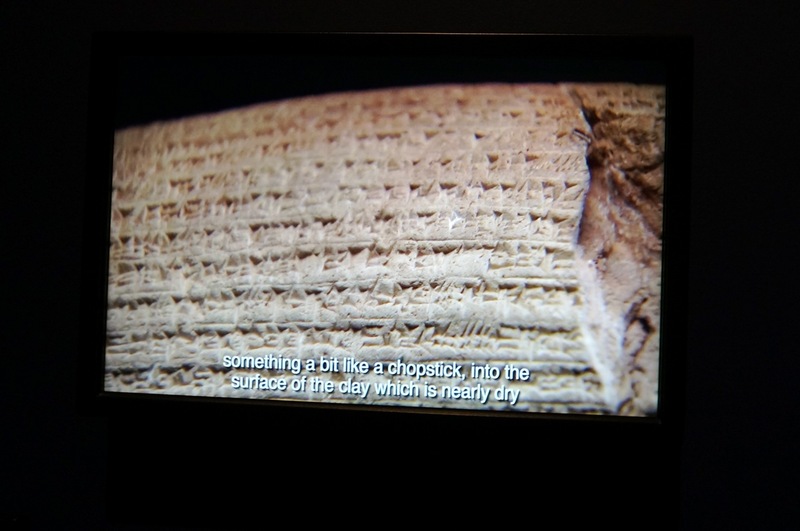 That’s why the Cyrus Cylinder is often referred to as the first “bill of human rights,” and why it is one of the most revered discoveries from the ancient world, especially among Iranian and Jewish communities. What to See: In addition to the Cyrus Cylinder, there are many related historical artifacts and luxury items on display including gold jewelry, vessels, and carved seals. Here are some highlights from my visit, as well as some from my friend Bita’s visit with her family. Writing Cuneiform: I wondered the same thing, and was happy to discover a video demonstrating how Cuneiform symbols were written on the cylinder (photo from video above). Ancient scribes used a tool similar to a chopstick to skillfully, and painstakingly, stamp the symbols on to the cylinder’s wet clay surface. It’s hard to imagine such patience in our fast-paced world of instant text messaging and emails. Gold Armlet: The gold armlet in the second gallery is one of the most stunning objects on display (photo above and below). Originally, the finely crafted griffins were embellished with brilliantly colored materials like gems and enamel. Scholars believe the armlet was used for ritual purposes, rather than for fashion’s sake. School Enrichment Ideas: If you have a middle school-age child, this exhibition ties in beautifully with LAUSD’s 6th grade curriculum “Ancient Civilizations.” The Villa’s incredible Egyptian mummy portraits (photo below) compliment the curriculum as well. Kian and his older Mateen loved seeing the portraits and learning all about the mummification process. Plan Your Visit: The Cyrus Cylinder is on loan from the British Museum and will be on view at the Getty through December 8, 2013. It’s a very popular exhibition so try to see it during off-hours. The Villa has special late Saturday hours until 9:00 pm through the run of the exhibition. Advance timed reservations required. 1. The Cyrus Cylinder, Achaemenid, after 539 B.C. Terracotta. The British Museum. Photo courtesy of Getty Museum. 3. 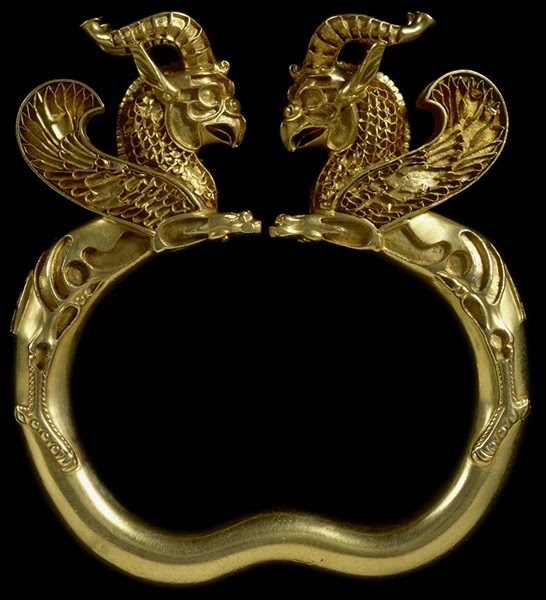 Armlet with Griffins, Achaemenid, 500-300 B.C. Gold. The British Museum. Photo by Museum Stories © 2013. 5. 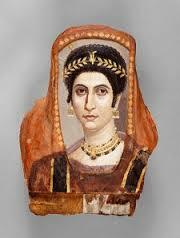 Mummy Portrait of a Woman, attributed to Isidora Master, Romano-Egyptian, about A.D. 100-110. Photo courtesy of Getty Museum.